The first thing babies do when they are born is cry and wail loudly, and this gets their little lungs going. They are no longer dependent on their mother for oxygen; they start living their lives, and their voice, their breath, is the key. Amirthavarshini was no different when she was born. and, at an early age when she decided to be a musician, she used her voice to birth her music career. “I learnt to sing before I learnt to speak,” she told me. And said it seriously, too. The daughter and elder child of Chennai-based musician and music director Sathish Varshan, Amirthavarshini would sing along with her father as he rehearsed at home for the numerous stage shows he held those days. When she was two and a half, she started performing with him, singing Tamil film songs solo. Varshan was a singer and a flautist as well as a pianist and a composer. Amirthavarshini would eventually become all of those. Amirthavarshini developed a deep desire to play the piano when she was in Std 1 in school. She enrolled for lessons under a well-known piano teacher in Chennai, Dass Daniels, who introduced her to western music, musical notation, and the concept of sight reading. “Learn the first piece in this book and play it for me in the next class.” Daniels handed her a book of sheet music when he felt she had a good enough grasp. But intervening circumstances meant there was a long gap before the next class and she learnt not only the assigned piece but every piece in the book. Admittedly, these were beginners’ pieces but an impressed Daniels told Varshan that his daughter could enroll in structured piano classes now, as she had a good grasp over the elements of music, including sheet music notation. So Amirthavarshini now sang Tamil songs on stage with her father’s troupe as she studied Western classical music on the piano. She would continue this pattern – one hand in Indian music, the other in Western music – down the years. When she was eleven, she stopped singing Tamil songs as the women’s parts required a very high pitch. Her voice was undergoing changes and she did not want to risk damaging it, perhaps permanently. Her father advised her to not stop singing altogether but sing English-language songs instead, choosing those that did not require a high pitch. She chose Michael Jackson’s “Beat It” and learnt to sing it just by listening to it, not worrying about the accent or other niceties. Other pop songs followed. But just like we (at least, the majority of us) need diplomas from school and college to be taken seriously, Amirthavarshini also sought certification of her musical abilities. Two British music institutions, Trinity College and the Associate Board of Royal School of Music (ABRSM) conduct examinations in India. The student enrolls under teachers approved by the music schools, who fly in examiners from overseas to conduct the examinations. She completed various examinations from Trinity College (Grade 1 to Grade 3 certification in piano) and also Music Theory (Grade 3). And then she stopped playing the piano. Or at least, it was no longer her main instrument. Why on earth, I asked, taken aback. “Well, Lydian started playing the piano,” she said, with a chuckle followed by an amused laugh, referring to her younger brother Lydian Nadhaswaram who has received national and international acclaim for his undisputed excellence on the piano. She still strums the piano for pleasure or when the muse moves her but from now her main musical instruments would be her voice and the flute. But from learning pop songs on her own, she started Western vocal lessons under the music educator Kavitha Poornima. In her three (Grade 2, then 4 and 5) ABRSM vocal examinations, she achieved distinction with high marks, and got to perform in the High Scorer Concert that follows the examination, the only student from Chennai to do so three years in a row. These examinations included operatic singing. This sparked her interest in opera. Poornima helped her lay the foundation, and she built on it with determination, striving to improve. She picked up the basic notes handily; her training on the piano and the music theory helped. She learnt her first flute piece easily: the song Kannan Vandhu Paadukindraan from the Tamil movie “Rettai Vaal Kuruvi” (The Sparrow with Two Tails). Ilaiyaraja had added two “tails” – elements of pop and jazz – to the Carnatic music-based tune, giving it an unusual air. She played it at a light music programme and the audience reception was so good that in future shows, she always played this song as the opening number. She picked up many more songs on the bamboo flute, learning on her own and clarifying her doubts with her father, who also taught her particular techniques to achieve specific musical effects. She also experimented on her own. For instance, with her brother, she arranged Ilaiyaraja’s song Raja Kaiya Vacha (movie: Apoorva Sagodharargal) for flute, guitar and voice, vocalizing the text with phrases like ta-tat-tarra tat-tarra instead of singing them. This exercise called for dexterity, both in switching bamboo flutes of various pitches and coordinating this with the voice part. Two years later, she set her sights on the Western key flute. The bamboo flute has six holes; she had assumed that the key flute would also have six keys. She was bewildered by the array of keys. The musician Balakrishnan, a leading key flute performer in Chennai, taught her to understand its mechanism and then play it. There were different bamboo flutes for the various scales and you switched flutes as necessary, but on the key flute all the scales were played on the same flute. She passed her Grade 2 examination in flute conducted by Trinity College, London, taking the first place in India with 97 marks out of 100. In 2017, she performed with distinction in the Grade 5 exams conducted by ABRSM in both vocal and flute, and performed in the High Scorer concerts for both categories. She continues her flute explorations. Alongside, she learns advanced music theory from Augustine Paul, the Music Director of the Madras Musical Association (MMA). MMA has always had a choir, but Paul added on an orchestra. Amirthavarshini joined the orchestra as a flautist and has played flute solos in their programmes. She is the orchestra’s sole flautist. As news of her proficiency on the flute spread among music circles, the music director C. Sathya gifted her a pan flute, one of the world’s oldest musical instruments. (Pan flutes dating back to the third millennium BCE have been found by archaeologists on the Aegean Cycladic islands off the coast of Greece.) The instrument consists of numerous pipes in a row. The pipes are either of different length or are blocked at different points. When the musician blows across the top of the pipes, each one produces a different note. Amirthavarshini can play it but has not practiced long enough to claim any degree of mastery. It is one more item on her to-do list. Amirthavarshini’s interest in Tamil film music still continues along with her equally strong interest in Western classical music; to some, the two would seem incompatible. But to Amirthavarshini, as to her brother Lydian, music is music. This hearkens back to Europe of the 1700s and 1800s when there was no distinction between “classical” and “popular” music. It was just music, full stop. People would go to the latest symphony, opera or concerto those days for the same reason that one goes to a rock or pop music concert today – to have a good time. Classical music was pop music. Similarly, Shakespeare wrote his plays for the masses, not for the elite. The highbrow-lowbrow divide is something that came much later. Amirthavarshini is also quick to point out that while many Tamil film songs are just jing-slap-bang pieces, others are accomplished compositions. She spoke of how composers like Ilaiyaraja, M.S. Viswanathan, A.R. Rahman and others have made highly effective use of Carnatic (and also Hindustani) classical ragas in many of their film songs. She and Lydian choose the ones which resonate with them, both for the feelings stirred by the composition and also by how neatly the raga has been used in the context of the storyline. Some examples are Meendum Meendum Vaa (Film: Vikram; Raga: Dharmavathi), Then Paandi Seemayile (Film: Nayagan; Raga: Natabhairavi), Aadal Kalaye (Film: Sri Raghavendra; Raga: Charukesi), Kannan Vandhu Paadukindraan (Film: Rettai Vaal Kuruvi; Raga: Natabhairavi), Raagangal Padhinaaru (Film: Thillu Mullu; Raga: Abheri) and Ennavale Adi Ennavale (Film: Kaadhalan; Raga: Kedar). How long does she take to learn songs like this? With full day practice, it would take two to three days; with a few hours practice per day, maybe five days. Songs that are not complex can be learnt within a day. Every piece of music teaches you something, Amirthavarshini observed, and sometimes it is unexpected. She mentions performing Sindhu Nadhiyin Misai, a poem on national integration penned by the Tamil poet, social reformer and freedom fighter Subramanya Bharati, reverently known as Bharatiyar. The poem was written much before Indian independence; the visionary poet foresaw how important national integration would be to a free India. “My father used to make karaoke tracks in his younger days and he would duplicate the exact notes of the original melody,” Amirthavarshini said. “One of his friends wanted this song to be made into a track and he didn’t want a bunch of musicians reducing it to a light entertainment piece. He entrusted my dad with the project. “We (Lydian and I) became involved too. Bharatiyar’s poem had already been set to music (by M.S. Viswanathan and T.K. Ramamoorthy) so we were able to make an arrangement for our instruments, I taking the flute part and Lydian the tabla. We had two versions: a karaoke version where I sang the chorus section, and another purely instrumental version (a video of which follows below). While we listened to what we had recorded, my dad explained to us how important this song was, and about Bharatiyar’s high standing in history and literature. An English translation of a few lines of the poem provides the flavour of Bharatiyar’s humanity and insight; the complete poem is longer and just as, if not more, profound. We row our boats merrily down these waters. For betel leaves harvested from the regions along the Kaveri. Let us offer them precious ivory from the Chera region. That will bring India and Lanka together. And what of all that excess water in Bengal? The other parched regions of our dearly beloved country. Amirthavarshini is constantly switching gears between India and the West. And when she puts down her bamboo flutes and picks up her shiny silver key flute, she not only plays pieces specifically meant for the flute but also compositions written for other instruments. Mozart’s Eine Kleine Nachtmusik was primarily written for strings, she points out, but it has flute parts and the whole piece can also be adapted for the flute. As part of increasing her understanding of and command over the flute, Amirthavarshini – on her own – renders English songs into flute arrangements. After hearing Amirthavarshini and Lydian ─ who are adept in both of these musical spheres ─ perform “Do Anything” (one of the compositions on “How to Name It?”), I asked Amirthavarshini about her experience of performing such a piece. She agreed that the spirits of Bach and Thyagaraja permeate the composition. The basic structure of western music is one melody that is supplemented by concordant notes (chords) forming harmonies. But Bach’s music is choc-a-bloc with counterpoint: two, three or even four independent melodies entwined one with another. The melodies often have similarities and form interesting harmonies together, but each melody can independently stand on its own legs. In other words, in music one can find ways to “do anything” if one has the will, the vision, and the talent. Speaking of talent, it is worth pausing for a moment to see what these young sibling musicians have achieved. The original piece has several musicians playing many instruments. In this recital, the onus is entirely on the siblings ─ the florid flautist and the punctilious pianist. And they rise to the occasion magnificently with a thorough understanding of the composition. Lydian even incorporates the music generated by the strings playing in the background into his piano rendition. Amirthavarshini and Lydian have been compared to the Mozart siblings: Wolfgang Amadeus Mozart and his sister Maria Anna (better known by her nickname, Nannerl), four years older than him; Amirthavarshini and Lydian are three years apart. Wolfgang and Nannerl were very close to each other, and were collaborators in music, as are Amirthavarshini and Lydian. As a performer Nannerl was top notch, but her public appearances stopped at 18. Girls performed in Europe those days but a woman staked her reputation by doing so. Not a single composition of Nannerl’s has survived; she eventually married, was compelled to give up her music career for a traditional housewife’s role and hardly saw Wolfgang. Amirthavarshini is determined that she should not end up like Nannerl. She is interested in composing original music, and also conducting symphony orchestras. While a conductor must know all the music, she explained, he or she must be proficient in at least one instrument. 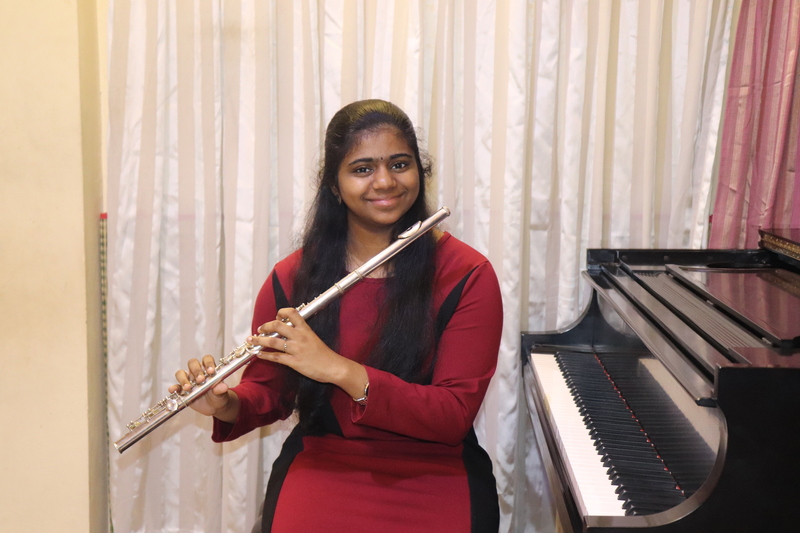 Amirthavarshini wants to get a degree in flute music, and then study conducting. Simultaneously, she wants to concentrate on voice – this makes it easier to arrange music, she remarked, explaining that some conductors sing and then arrange the notes – for instance, for a four-part harmony (SATB) choir. International exposure has also helped broaden her horizons. In 2017 and 2018, she and Lydian obtained scholarships to attend the summer music camp of International Music Sessions (IMS) on Long Island, New York. The brainchild of the renowned pianist, music educator and entrepreneur Theresa Kim, IMS brings talented child musicians from New York and other parts of the United States as well as from across the world (from countries as disparate as Afghanistan, India, Tunisia, Israel, Iran, Kenya, Congo, Vietnam, Mexico, Colombia, and Bolivia) for a summer music camp on Long Island where they have workshops with experienced and well-known musicians. Here are some of her thoughts on music: “Music is very important, not only for musicians but for each and every person. Some musicians say, ‘I just play music to express my feelings.’ This is the truth, as every musician feels their emotions in some way. There are some things you can’t speak about or discuss with others but if you are able to express those feelings through music, you’re able to relax yourself. And whether you are a bad guy or a good guy, everybody likes music so it’s very important, actually. Just like any young, talented person, she has her dreams: of conducting orchestras in the most famous auditoria in the world – Carnegie Hall, the Sydney Opera House – who, perchance, might also play her own compositions along those of the other famous composers. But dreams are achieved by hard work a step at a time. And besides music teachers, a supportive family is key. Apart from her father and her brother, there is her mother. She drives them (Lydian and her) to all their classes, juggling this with running the household; both children are very grateful. And if they become a little too lax in their music practice, she takes them to task and they take up their instruments. Amirthavarshini has just taken two exams of the ABRSM: Grade 6 in Vocal and Grade 7 in flute. And she has another practical musical goal for the immediate future: she is learning to play the clarinet. Vishwas R. Gaitonde spent his formative years in India, has lived in Britain, and now resides in the United States. His writings have been published in all those countries, and elsewhere. His literary distinctions include the Tennessee Williams Scholarship to the Sewanee Writers Conference and a writing residency at The Anderson Center (United States); a Summer Literary Seminars fellowship (Canada); and the Hawthornden Fellowship (Scotland). One of his published short stories was cited as a Distinguished Story in Best American Short Stories of 2016.